Property flipping in today’s rocky housing recovery means staying one step ahead of the game — a game that is becoming increasingly cutthroat. Foreclosures are drying up and cash-heavy hedge funds are still buying low-end properties to rent. For a home flipper, someone who buys and sells a home in the same calendar year, the pickings are ever slimmer, but the profit can still be high. “Investors are finding creative ways to pinpoint potential flips in the off-market arena, and on the disposition side investors have a bigger pool of potential buyers thanks to a surge in FHA buyers this year, many of them first-time buyers looking for starter homes,” said Daren Blomquist, vice president at RealtyTrac, a foreclosure listing and analytics company. The share of homes flipped jumped 18 percent nationally in the third quarter of this year, compared to a year ago, according to a new report from RealtyTrac. Gross profit moved slightly higher. Doug Van Soest has been flipping properties in California’s Inland Empire region since 2008. He used to buy foreclosures off the local area listing services, but no more. Now he has a new strategy. “As those became less and less and the competition was getting higher and higher, it was harder and harder to find homes that it made sense to flip. We started mailing directly to homeowners to see if they’re interested in selling,” said Van Soest, who flips 30-50 properties a year, mostly priced under $300,000. He targets several different categories, using real estate databases and new real estate apps. He started mailing to small-scale landlords who don’t live near the homes they rent out. The hope being that they might be tired of dealing with the property management and just want to get out. He is also going after potential sellers who are not on the market. For the seller, he says, it is an enticing prospect. They can sell the home without paying commission to a real estate agent and without having to fix it up to show. They don’t have to go through any of the grueling, mortgage-dependent sales process that regular sellers do. 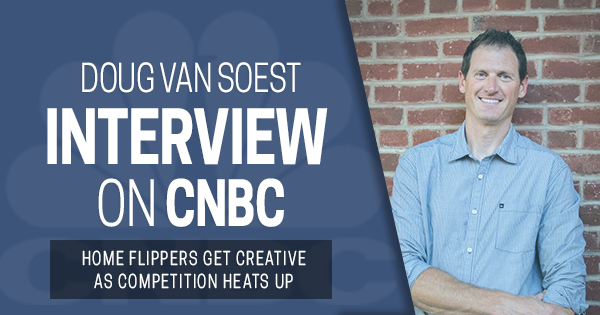 “Sell it quickly and be done with it,” said Van Soest. Flipping actually edged out renting as the preferred strategy for investors for the past year, according to Auction.com, a real estate auction company. Investor demand in single-family rentals has been very strong, as homeownership is now at the lowest level in half a century. As buyers trickle back, however, especially to lower-priced homes, flipping is more attractive. “Rising prices and extremely limited inventory make a nearly ideal environment for real estate investors who want to buy, fix and flip properties, and that is precisely where we are in today’s market,” said Rick Sharga, executive vice president at Auction.com. The average gross return on investment was 33.8 percent for completed home flips in the third quarter, up from 32.7 percent in the third quarter of 2014, according to RealtyTrac. Some markets, of course, are more lucrative than others. Baltimore, Tampa, Florida, and Chicago hold the top spots for gross flipping returns. The largest share of flips goes to Nevada, Florida and Alabama.